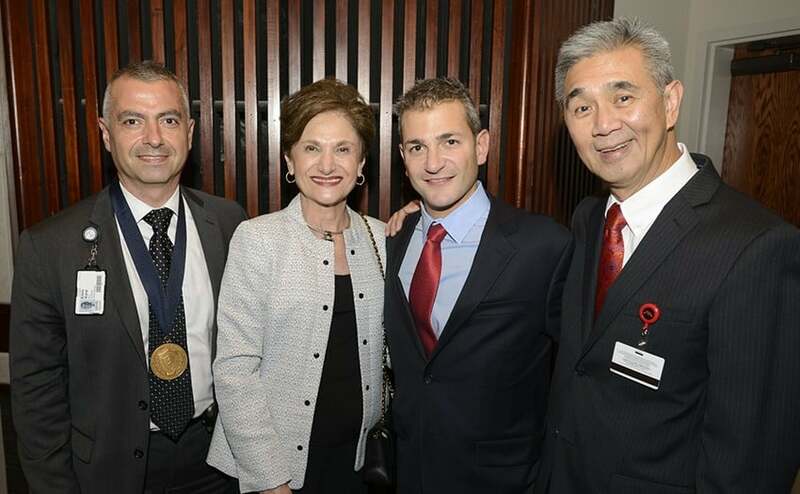 Emre Vural, M.D., left, is joined by Gerald Hamra's widow, Carolyn; his son, Ryan; and chairman of the the UAMS Department of Otolaryngology-Head and Neck Surgery James Y. Suen, M.D. 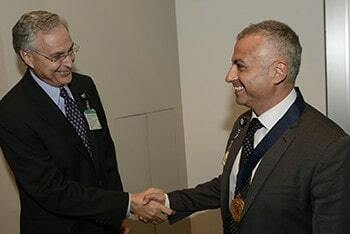 UAMS Chancellor Dan Rahn, M.D., congratulates Emre Vural, M.D., on receiving the Hamra Professorship in Otolaryngology. Sept. 2, 2015 | LITTLE ROCK – Emre Vural, M.D., has been named recipient of the Gerald F. Hamra Endowed Professorship in Otolaryngology at the University of Arkansas for Medical Sciences (UAMS) at a ceremony held today. Vural is a professor in the UAMS Department of Otolaryngology-Head and Neck Surgery. A businessman and philanthropist, Hamra served as CEO and chairman of the board of Wendy’s of Little Rock Inc., one of the nation’s most successful Wendy’s franchises. He died of head and neck cancer in 1995. Donations totaling $500,000 from numerous friends, family members and colleagues of Hamra were used to establish the professorship, the interest from which supports head and neck cancer research programs at UAMS. “Mr. Hamra’s generosity and leadership were well known throughout Arkansas. Dr. Vural’s expertise makes him an excellent choice to receive this professorship honoring Mr. Hamra and carry on our important research in head and neck cancers,” said James Y. Suen, M.D., distinguished professor and chair of the UAMS Department of Otolaryngology-Head and Neck Surgery. Suen was named inaugural recipient of the professorship in 2000. Vural received his medical degree at the Ankara University School of Medicine in Turkey where he also completed his residency training in otolaryngology-head and neck surgery. This was followed by two fellowships at UAMS, one in head and neck surgery and oncology, and one in facial plastic and reconstructive surgery. As a head and neck surgeon, Vural’s clinical focus is on the treatment of benign and malignant tumors of the head and neck as well as plastic and reconstructive surgery of the face. He is director of the Transoral Robotic Surgery program at UAMS.